Whether we’re ready or not, we’re leaving Beijing on bicycles 5 hours from now to begin our journey. After a night of celebration for Mid-Autumn Festival, I’m about to catch a couple of hours of sleep before we leave for our first 100km tomorrow morning at 9am. Sean and Kevin arrived safely on Saturday and have been quickly acclimating themselves to China and all there is to learn about this incredible country. Unfortunately, I have to keep this brief for now, but all I can say is Beijing has been nothing short of amazing and all of the people who have helped us along the way have already enriched our experience and have made the transition to China much easier than expected. We now have internet, a cellphone, and lots of information about what might encounter on the open roads between here and Shanghai…. But really, nothing can truly prepare us for what lies ahead…Finally it is time to begin our epic journey and to see what life in China is like outside of Beijing and the glow of the Olympics. So with that said, I have just two things to say—Bon Voyage and Man Zou! Late night at the Bamboo Gardens, Reidster and Kevin discuss how excited they are about leaving the next day at 9am. Check out the awesome Norco Bicycles behind us and our slick new Casual Industrees t-shirts. Christine Boyle: Born and raised in Lake City, Seattle. Home girl to the bone. She has been an invaluable friend here in Peking. Christine has helped the ManZou team line up interviews, cell phones, Skype, good food, bike shops, tourist sites, drinking establishments, new friends, cultural rules…just about everything. She has made the transition from Seattle to China very easy. Thank goodness we have Christine!!! Christine is here working on her fulbright fellowship, researching water resource policy in China. Also she is a Doctoral Student at the University of North Carolina. Our presence here in Beijing has distracted her from her hard work. Tonight we are celebrating Mid Autumn Festival. Having a great meal with new friends. Red Jason..getting ready for a 1200 mile bike ride! 15 hours time difference from Seattle. That’s a long time! After a busy day “Man Zouing” around Beijing all day yesterday, Ian and I hit the wall and crashed way too early last night. 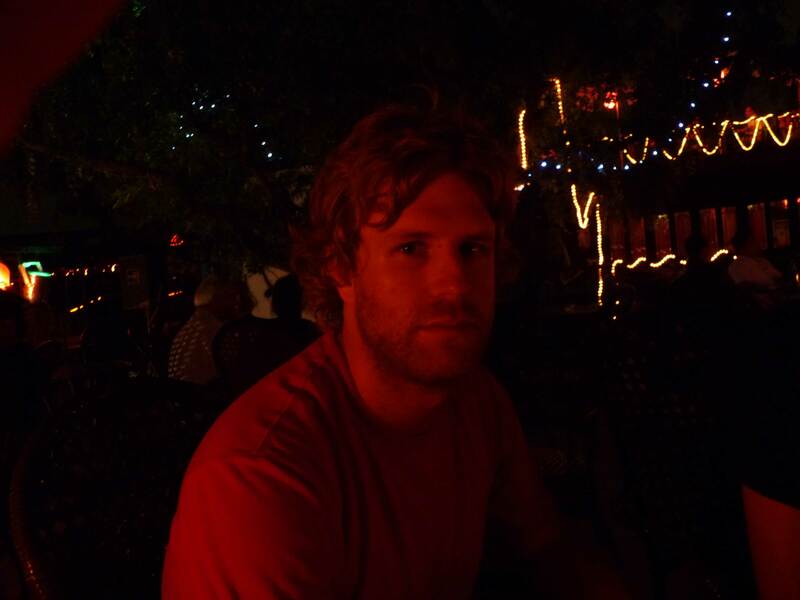 Now I am writing this blog post, wide awake at 4am from my hotel in Beijing. Ian is still trying to get a little more rest, but I can’t get back to sleep. The beginning of our bicycle adventure is rapidly approaching and Ian and I are starting to realize the magnitude of our undertaking. While Beijing has the largest bike lanes I’ve ever seen, people drive totally different here and we are quickly learning the ways of the road. The main thing to remember is that you CAN’T rely on them to yield to you, especially on right turns. Cars here have the right of way, which is definitely something we will have to get used to. Our bicycles did manage to make it through the plane flight sustaining only minor damages and we got them reassembled and they’re ready to go. We may take a ride tomorrow to test them out if we don’t get to hung up shooting more footage of this massive city. Yesterday was a gorgeous day here…87 degrees and not a cloud in the sky. 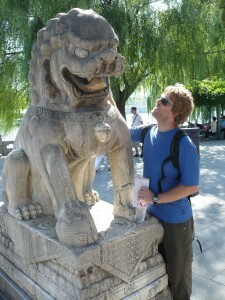 We walked all over town including Beihai Lake, the Forbidden City and Tiananmen Square, getting some great footage. The city is remarkabley clean and eerily quiet. After talking with our friend here Christine, she said that in the months leading up to the Olympics and during the games, the city has been very low key. Lots of bars and restaurants have been closed and many, many people have left the city. It seems to be returning to normal a little more each day. 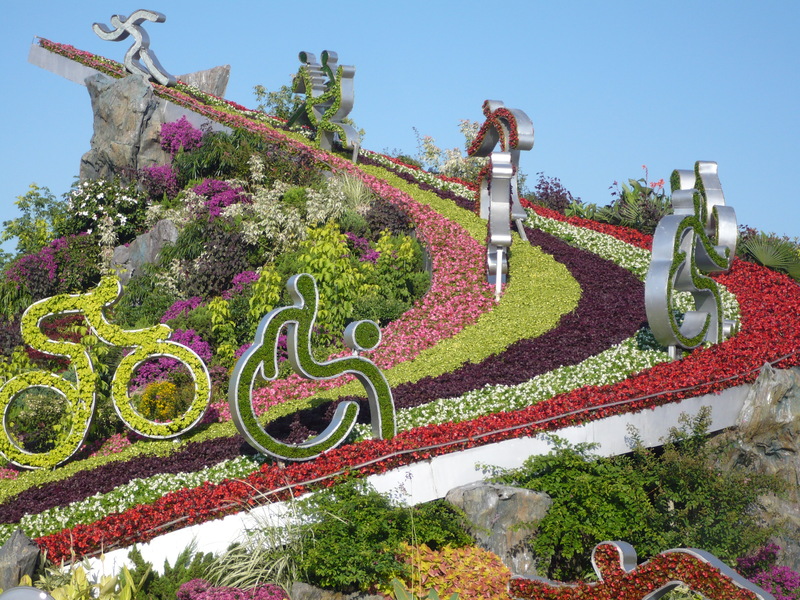 Right now the Paralympics are going on and we may even get a chance to go see Murderball (Wheelchair rugby) on Saturday. Anyhow, I guess that’s it for now…I better go and try to get a little more shuteye before it gets light out. Looking forward to the arrival of Sean and Kevin on Saturday and getting out there on the bicycles. Thanks again to all our great sponsors. So far all our gear is working out phenomenally and we’re totally happy with everything. 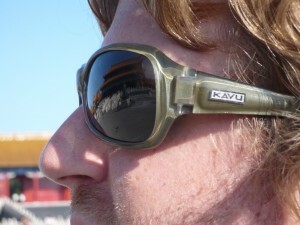 Here are a few pictures from our day yesterday…Check out our cool Ex Officio and Kavu gear. 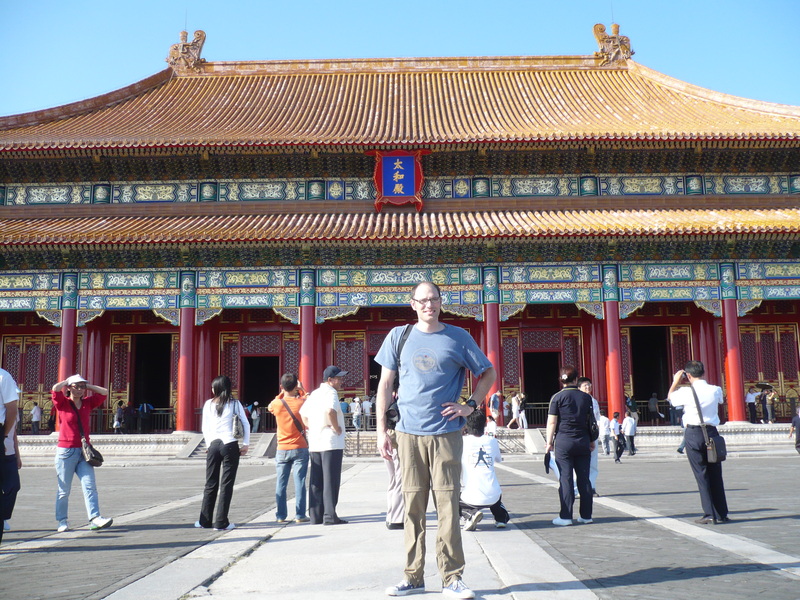 Ian in the Forbidden City. Thanks Kavu for the awesome shades...Check out the reflection of the Hall of Supreme Harmony in the Forbidden City. Just a few more days until we cycle out of Beijing on the floor-lined streets! 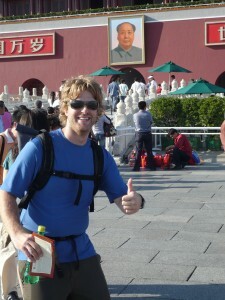 Reidster and Mao--Together at last! Our adventure has officially begun. 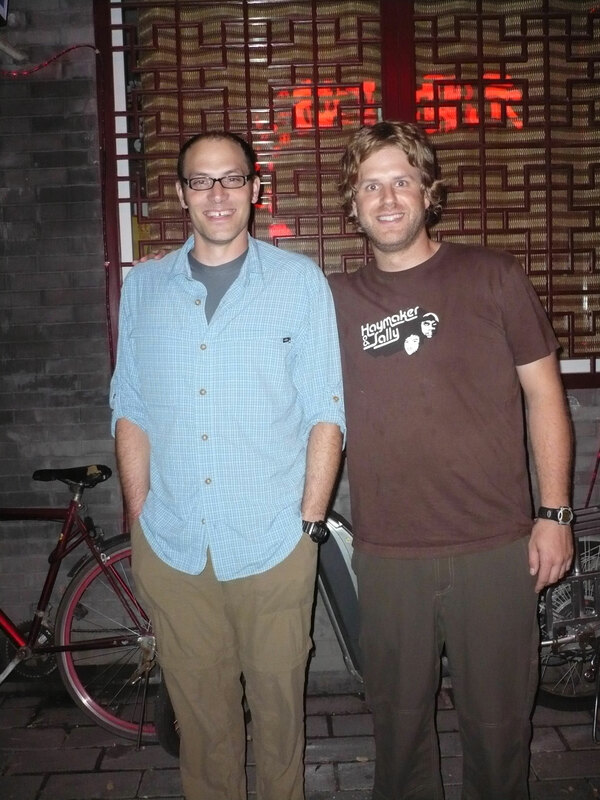 Ian and I arrived in Beijing a few hours ago and are extremely jet-lagged after our long day of travel. 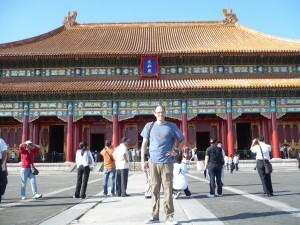 We left Seattle at 9am on Tuesday and arrived in Beijing around 3:30pm on Wednesday. Our great hotel, the Bamboo Gardens, is in one of the most interesting areas of Beijing. 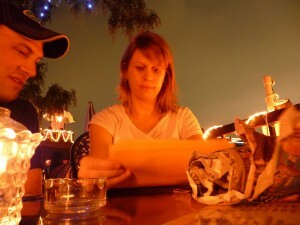 We met up with our main contact here in Beijing, Christine Boyle, who took us out to a cool restaurant with seating on the roof of the building. She invited some friends and we all had a good time eating the delicious food and getting to know each other. Now, unfortunately, it’s time for me to get some long-awaited sleep. Tomorrow Ian and I will be hitting the town and doing a lot of shooting all over. 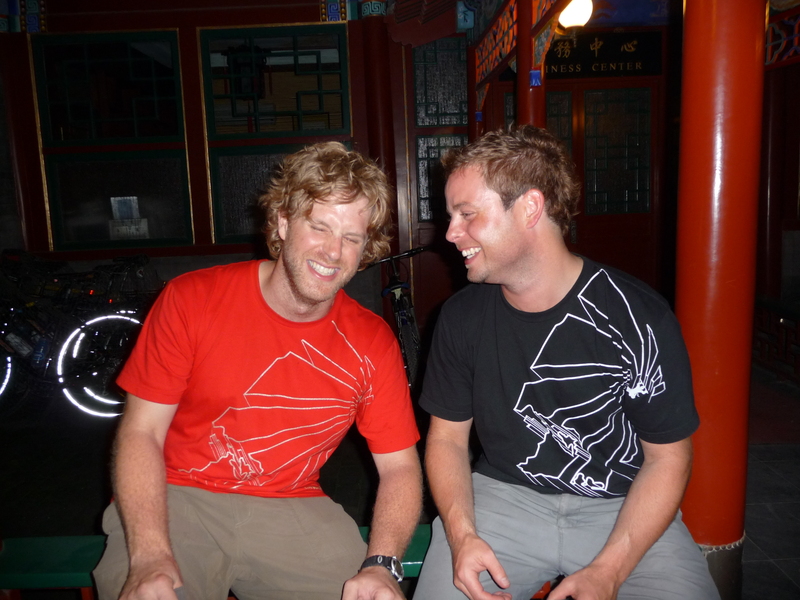 Sean and Kevin will be leaving on Friday and arriving Saturday….Then we begin our bicycle adventure on next Monday! Be sure to stay posted to the blog as we will be updating it as often as possible. Thanks again for everyone who donated to the project! Ian & Reidster in Beijing-Ready for action!